No, we haven’t fallen off the face of the earth! I guess blogging is like any other habit that you get into – once you start to get out of the habit, it’s easy to start putting it off. I don’t want to stop blogging entirely but I’m not sure what the optimal schedule is for me. Something to think about after we get done at Amazon. So I’ll guess I’ll start with that – yes, we are back at Amazon. It’s been a pretty good season so far, as we are starting to get back to ramp up time. Harry and I are pickers again, and still liking that job position a lot. We walk generally anywhere from 14 to 17 miles a day. We’ve been feeling good and are a little under 8 weeks from the end and departure day. There’s really not much new about Amazon. We walked back in and by lunchtime of the first day, we literally felt like we had just left a couple weeks ago. Probably the most exciting event since we have been here was the celebration of my 50th birthday a couple weeks ago! Since I was working on the actual day, I celebrated on my first day off afterwards – ran 5 miles in the morning, and had an awesome dinner out with friends that night. Hard to feel depressed about a birthday when I am feeling the best I have ever felt in my life! Now I’ll back up to a few events since my last post. We were up in Peru, doing lots of great mountain climbs and spending time with my mother and stepfather. This was the best summer for hiking ever! I felt the best I have ever felt, and we did some challenging and rewarding climbs. It was awesome. Not sure why but this was one of my favorite hiking shots of the summer. From there, we traveled to Ohio. We had a great three weeks there, enjoying some more great family time with my stepdaughter Gretchen and our two little guys. We got to see some soccer games, went to the movies, spent time outside, did some cooking, went for ice cream. Just an all around fun time. Labor Day weekend, we headed for Kentucky. Although it wasn’t yet time to start our Amazon jobs, we had heard that the campground where we usually stay here was filling up quickly this year. Since we weren’t going to actually start until the end of September, we made the decision to drive to Kentucky and leave the rig here, traveling back to NY by car instead of driving the fiver back which was our original plan. 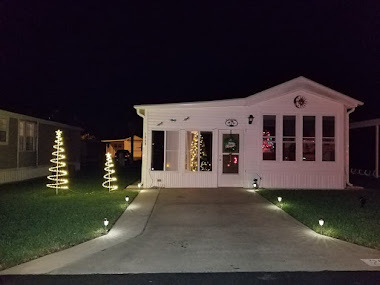 Even though it wasn’t our rationale, I figured out afterwards that we saved over $1,100 by doing it that way – even figuring in the cost of the campground for three weeks and renting a car for the trip back. When we got back to NY, we spent a few days with my sister, who was generous enough to let us crash in her guest room for a week! We were able to take in some soccer games as both my niece and nephew were on their high school soccer teams. And that more or less sums up the past couple of months. Now we are back in our normal autumn gig working the peak season at Amazon. This is our 4th season, and we have about 8 weeks left before we will head south to Florida for the rest of the winter. It seems odd to not be at Amazon this year. I'm sure we don't miss the work, but miss the gang. It's nice being in sunny CA, and being able to tend to mom. The Amazon season is flying by!